Luminous colonial apartment, with excellent location. Ideal for a couple. 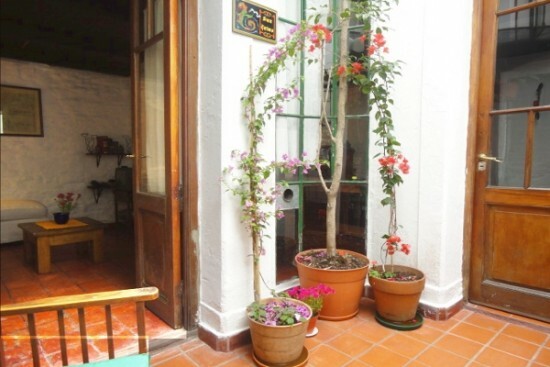 In the entrance, you will find a small patio with many plants, to enjoy fresh air. The apartment has a comfortable living room, fully equipped kitchen. It has two mezzanines: the main, works as a bedroom with a double bed. And the second, works as a desk and closet with a large wardrobe. Private terrace with shower. If you want authentic atmosphere rather than an antiseptic hotel, then this is what we offer. Valid offer to stay from 3 months. This place and Casa San Telmo is a find. The apt is warm and cozy, Eva (the owner) is near at hand, efficient and professional. If you're looking for a home from home, providing a tranquil haven after a day and/or night out in Buenos Aires - look no further! Nice and unique place to stay. Loved that the rooftop terrace had some sun even in winter, and the neighbors (including a very friendly cat) were very helpful and amable. Kitchen is not fit for more than some pasta or heating up a dish, but that was really the only drawback. Had a great stay! This is definitely one of the most charming apartments in BA. It's one of the few options in the city where you actually get a small house, so you have your own roof terrace and a tiny patio. And it's truly great to be able to go outdoors especially in summer. The location is no less than perfect, safe and still in the middle of everything. Restaurants and shops around the corner. Don't miss the farmers market on Fridays just 100m's away. The owner Eva is very sweet and anxious to make your stay as wonderful as possible. But don't choose this if you have problems climbing stairs and be aware that the house is quite open inside, which leaves little privacy if you're more than one or two people. The place was absolutely beautiful. We found it to be as nice as the pictures indicated, if not better. Clean, bright, easy to get to, lively neighbourhood and a lovely walk to anything you want to see. Thank you. My husband and I traveled through Argentina for the month of May and hands down this apartment was the most charming place we stayed at. Situated in a wonderful neighborhood, the apartment was very comfortable and has everything you need to have a pleasant and relaxing stay. We found ourselves dining quite a bit in the neighborhood and found everything excellent. I recommend this place to any couple - perfectly located and much better than a hotel or bed and breakfast in my opinion.